Have you noticed the rise in Korean restaurants across Adelaide lately? There have been quite a few springing up and on Sunday night we were fortunate enough to dine at Koyeosa. Having opened a mere three weeks ago this elegant restaurant located down the southern end of Pulteney Street has already become popular serving up great Korean cusine. 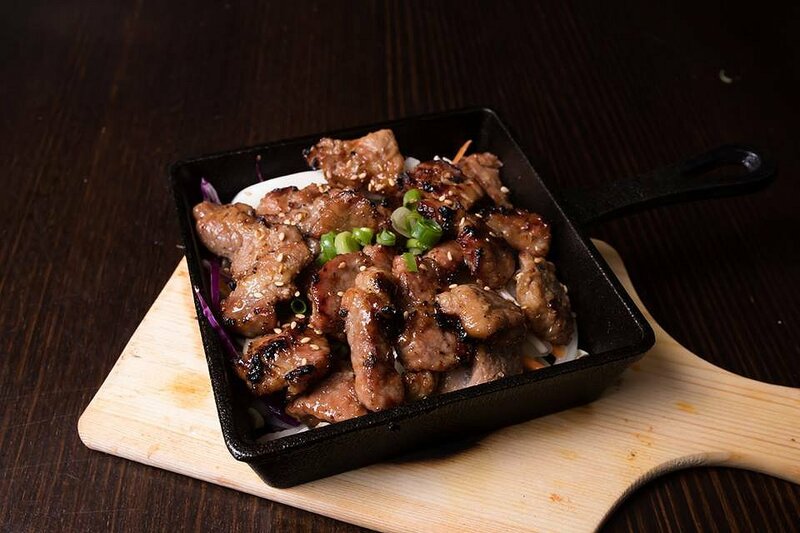 With a comprehensive menu of tapas, Korean Charcoal BBQ and Hot Pots to share it is easy to try an array of dishes. The wine list is small but pleasing and BYO is available for $13.50. 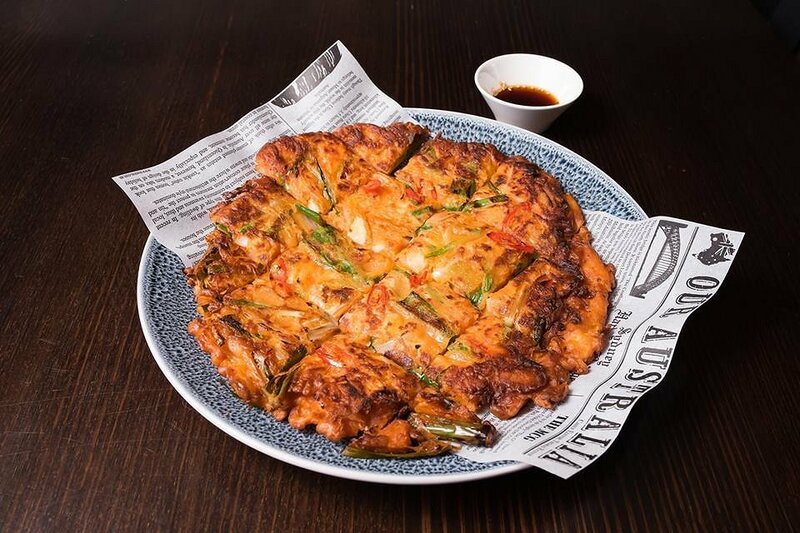 I cannot recommend the Kimchijeon; Korean crispy Kimchi and vegetable pancake enough. It is an absolute must have at Koyeosa. This delicious pancake has a lovely hint of spice and fresh crunchy spring onion that plays off against the crispy edges and soft inside. We were equally impressed by the Mandu; a pork dumpling that has been deep fried then slightly boiled served with special soy sauce. 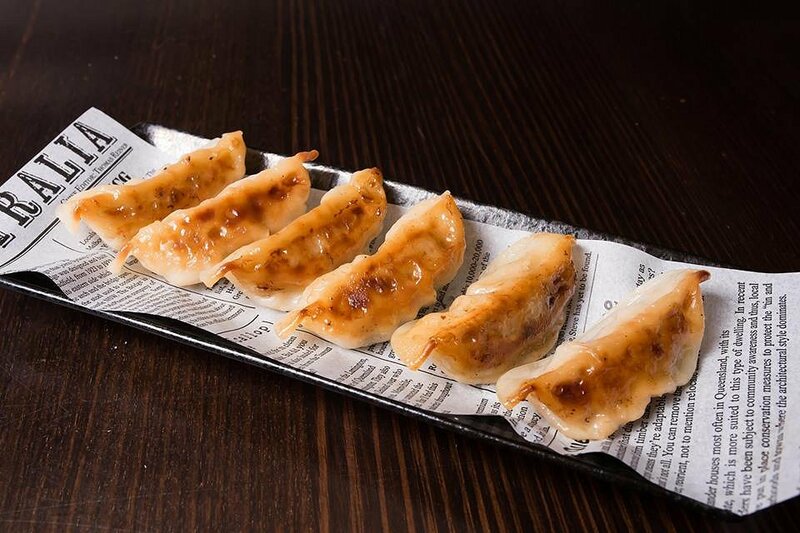 The frying process ensures a delightful crispy edge to the dumpling containing a silky pork mixture complemented by a sesame vinegar sauce. 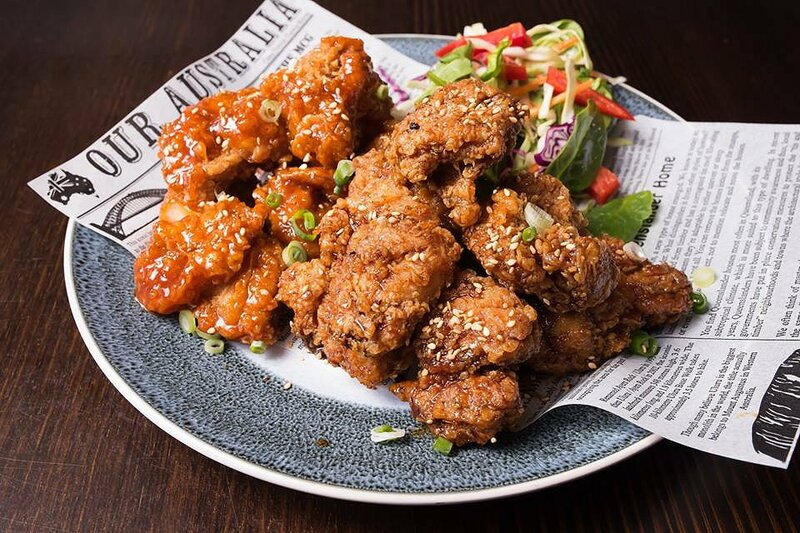 Korean Fried Chicken is currently taking Adelaide by storm, and why wouldn’t it? The crunchy deep fried bites are far less greasy than the Colonel ever imagined and with tangy, sticky glazes that are so much nicer than those secret herbs and spices, let’s hope this craze continues. Koyeosa serve up their Dakgangjeon with either a sticky, sweet tangy and spicy sauce or sweet soy sauce. It’s impossible to ignore how outrageously crunchy the coating on the chicken is and with its succulent inside, Koyeosa are onto a winner. We tried both options of sauce and because I think everything is better with chilli I favoured the spicy one. 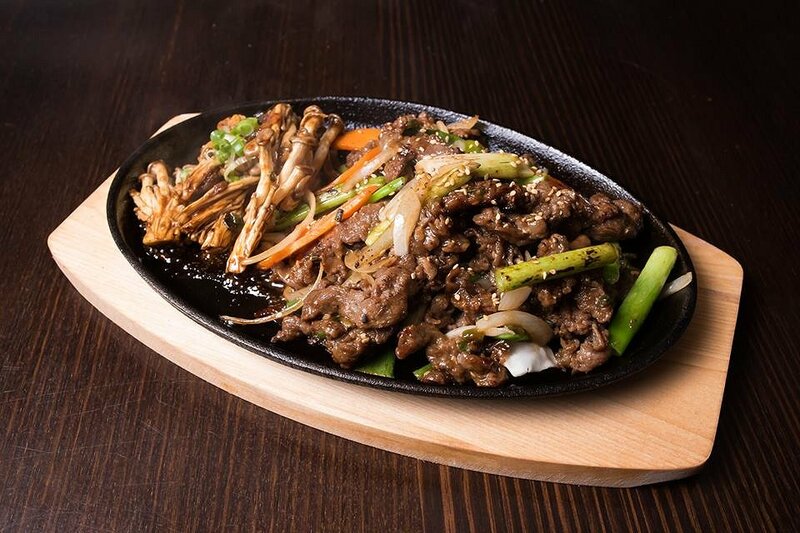 Our final tapas were the Bulgogi – thin marinated beef and vegetables. A quintessential Korean dish we adored the tender, melt in your mouth beef complete with char flavour with a hint of those typical sweet fermented Korean flavours. 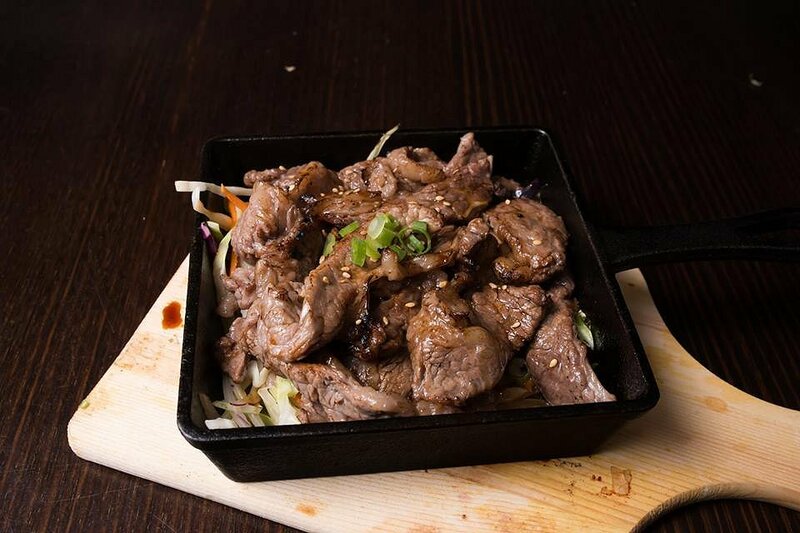 A spot on Bulgogi that showcases this famous dish. Moving onto the Korean Charcoal BBQ we chose 3 of the 5 offerings, each are served with 3 dipping sauces (soya bean paste, sesame and salt and ponzu sauce with wasabi) and served on cabbage salad. All dishes can be ordered in entrée or main sizes (entrée size pictured). As there are 3 different styles of pork; 2 of them pork belly, we selected the Dwaeji Galbi – special sweet soy sauce marinated pork. The strips of pork scotch are sweet and succulent. The caramelization of the marinade brings out the natural sweetness of the meat. In contrast the Chadol – thin strips of Japanese Wagyu beef brisket lets the bold richness of the meat shine. I love simplicity of this brisket and how it is not hidden by sauces. In saying that, the trio of sauces that accompany every BBQ dish brought new flavours and notes to the meat, each one delicious. 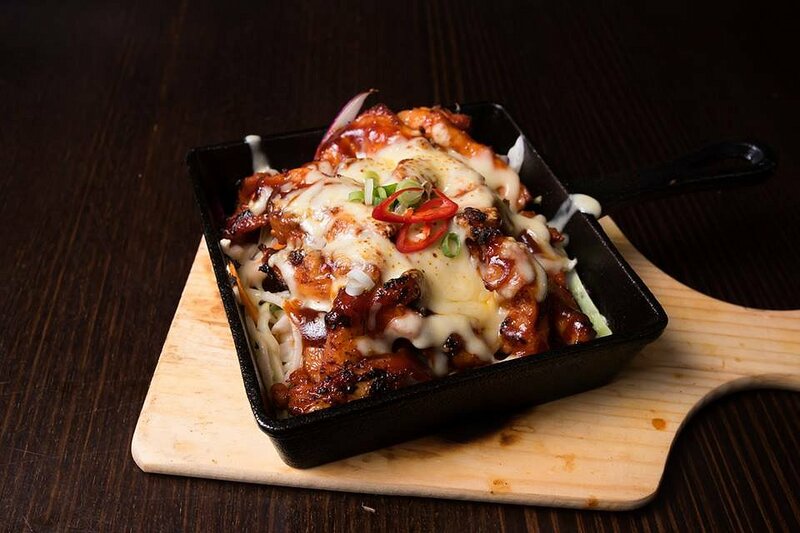 Chicken lovers will embrace the Buldak – Boneless chicken strips slathered in a tangy sweet chilli type sauce that has a creeping heat; minimal to start but by the end its presence was felt. In an unusual twist the chicken is topped with molten mozzarella, an extravagant and luxurious addition that works very well. I can happily say that I would go back to Koyeosa in a heartbeat. I’m already craving the Kimchijeon and I think I’ll be having it again before the week is over! Do yourself a favour and head into the city for a Korean feast.